I'm often asked about which Nikon camera is the successor to a certain model, or which cameras are considered consumer or professional. Or even which new camera was derived from which older model. There's no easy answer to any of these questions, as Nikon has used parts and designs from multiple models for new ones. However, there are some basic lineages that can be discerned. 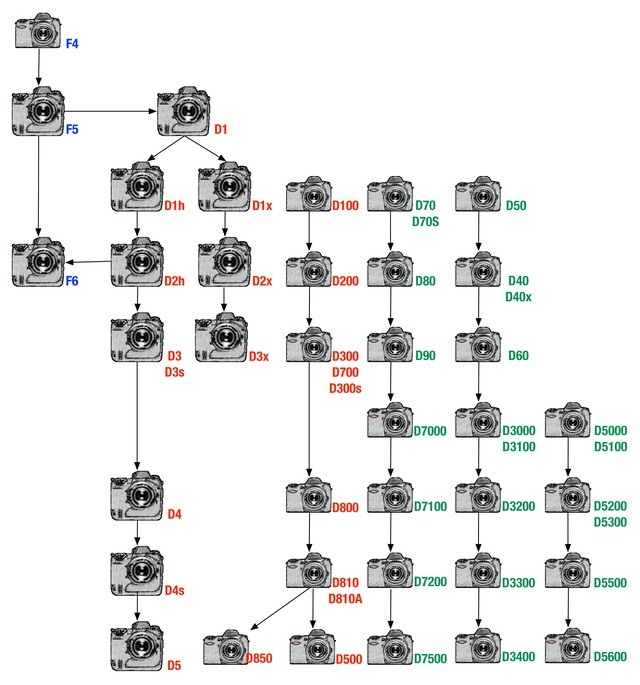 In the chart that appears below, bodies in blue are film SLRs, bodies in black are pro DSLRs, while bodies in gray are consumer DSLRs. History progresses from top to bottom, capability from right to left. In other words, the most recent, most capable body would be in the lower left, the oldest, least capable body would be in the upper right. Bodies in the same vertical line use the same basic "platform." This isn't a perfect representation, as Nikon didn't release these cameras together as this implies, and there are thus intergenerational differences that are sometimes meaningful, but in terms of the way Nikon was thinking how these cameras related, I believe this chart to be accurate to their R&D decisions.